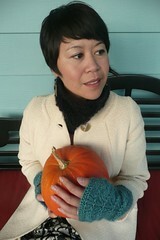 I have fallen in love again with a pattern I wrote 2 years ago: Long Scalloped Glove Adrienne. I have always been fond of this particular pattern which I named after my beautiful tall friend and co-worker Adrienne. It was so much fun figuring out how to make this long fingerless glove and I remember how amazed I was with the result! It has brought me so much joy back then, and nowadays I have fallen in love with it again. The base pattern of this glove is merely the beautiful Feather and Fan, my ultimate comfort stitch. It is in my opinion the easiest lace stitch out there, it never fails to entertain me and I am never tired of its elegant appearance. And because Feather and Fan never fails me, I decided to also make a nice and light little cowl with Rowan’s Kidsilk Aura to keep my neck warm without too much bulk. Quite the opposite of that huge and bulky garter stitch scarf! 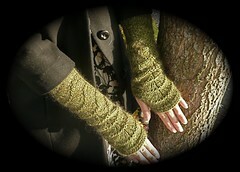 I think these Adrienne Gloves make for a very great Christmas gift. You can make them in many different yarns, just make sure you choose a heavy dk or light worsted yarn and you are going to be just fine. I made mine with Manos Silk Blend, Cascade Venezia, Rowan Tapestry and Berocco Ultra Alpaca. 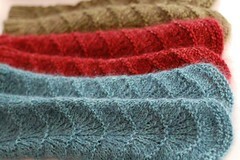 It is a pattern that looks great in many many different yarns! So what are you waiting for… knit a pair of Adriennes! And guess what… the pattern is still offered for free on this blog. 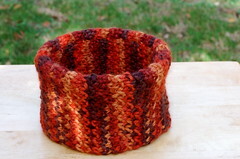 Click here to get to the page with the pattern. Oh, before I forget: on Friday, November 6th I am planning to have a little Getting Purly With It party at the yarnshop CloseKnit. We are going to display Getting Purly With It patterns that I have put out so far and there is going to be a little trunkshow too. So pencil it in: Friday November 6th, starting at 6pm at yarnshop CloseKnit on Alberta Street in Portland, Oregon. I would so love to meet you! More details will follow in the next few days, okay? Hair, make up and photography of images taken of me: Kassandra Sommerville from the Ginger Suite Salon. 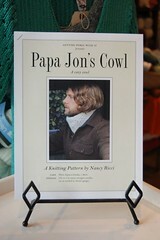 I am very happy to introduce to you my latest pattern: Papa Jon’s Cowl. 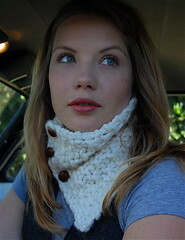 It is a cozy piece, perfect for those who want a no hassle, simple, warm and soft cowl. In my last post I wrote about how I worked with the very slouchy fiber alpaca and found a way for it not to slouch. I am happy with the result! 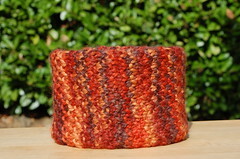 For this cowl you just need one skein of Misti Alpaca or Plymouth, needle size #10 and some sewing skills. 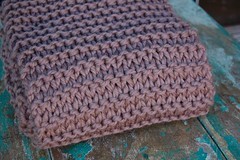 I think this cowl is just perfect for gents and also for ladies. 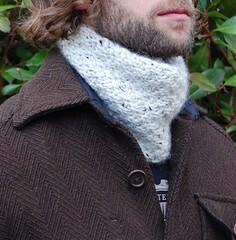 I chose for a male model because I think especially guys will be attracted to a simple cowl like this. I am so lucky that Jon (yes that is the model’s name, I named the cowl after him! ), was willing to do a photoshoot. The pattern will be available in the first week of November at yarnshop Closeknit on Alberta Street in NE Portland, Oregon. 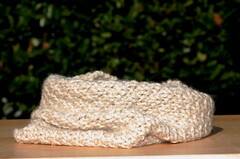 I just love the simplicity of this cozy cowl… Hope you like it! It looks good on Jon, don’t it? Hair and make up: Kassandra Sommerville from the Ginger Suite Salon. Alpaca is one of my favorite fibers to work with. 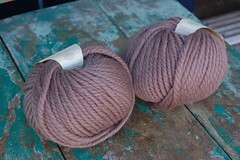 It’s soft long fibers mesmerize me to no end and I have made many a project with Alpaca. From the very first moment I started experimenting with Alpaca, I noticed how it slouches so beautifully and how it has some good weight to it. And its softness, oh my! 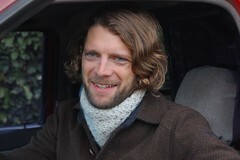 It was in October 2008 when I decided to knit a cowl made out 100% Alpaca. I wanted to feel its softness close to my neck while biking during a crisp not yet too cold Fall day and feel all warm and cozy and happy. 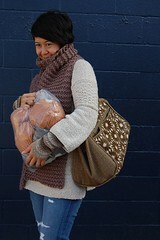 So… I casted on with some 100% Misti Alpaca, knitted it up in 2 nights and was so excited to wrap it around my neck. I was unpleasantly surprised when my much anticipated warm and cozy 100% Alpaca cowl just slouched down my neck and did not stand upright! I slapped myself on the forehead; of course it won’t stand up! 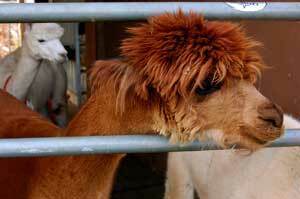 It is Alpaca Fiber! It slouches down! 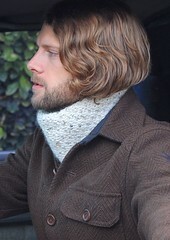 Still, I wanted my 100% Alpaca Cowl! Dear reader, I cannot tell you how I cracked my brains to figure out how to defy Alpaca’s slouchy character. It kept me up several nights in a row! Look! I found a way to make it stand up! I was so happy about it that I decided that this pattern was going to be a pattern I would be putting out in the Fall of 2009! Me and my graphic designers have been putting together a nice pattern and I also have had a photo shoot with a handsome male model. I am so very excited to introduce this pattern to you very shortly! In a couple of days, you will see how it came out. So come on back here, okay? 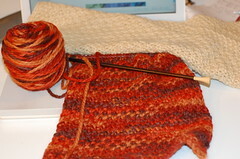 When I was a very new knitter I only knew how to do the knit stitch. 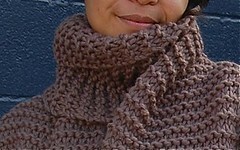 So like many new knitters, I made a scarf entirely made with the knit stitch. 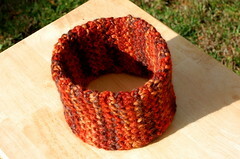 I learned quickly that using only knit stitch in a garment, is called “Garter Stitch”. Other than in my very first scarf, I never ever used the Garter Stitch again. That is, until recently when a lady walked into the yarnstore with the most beautiful and luscious scarf. 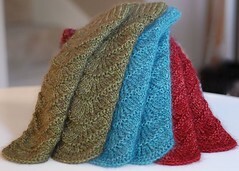 I was simply captured by it and was surprised when I found out it was made with merely Garter Stitch! I could not stop thinking about that scarf and just had to make it myself! And guess what… it makes for a SUPER QUICK KNIT! Splendid! Soooo…. get yourself three balls of Rowan Big Wool, cast on 18 stitches with needle size US17 and knit every row until you run out of yarn. Simply does it, simply garter. Hey everybody… how you doin’..? For the past couple of hours I have been working on an elaborate and eloquent piece of writing that was to explain why I have been away for so long. But then I changed my mind and I am going to just tell you like it is. See, sometimes, I am plagued by life’s questions and when I cannot get answers I get frustrated and stuck. When this happens, absolutely nothing will flow within my being and I realize that I am creating some pretty big hurdles to jump over for myself. Searching for answers, which created even more questions, walking into walls, breaking through those walls, creating hurdles, jumping over hurdles, bouncing back and forth in a closed up circle of sad energy, crying, reaching out to researchers, reaching out to my family, asking even more questions, diving into my heritage, trying to figure out what has happened to my ancestors, feeling lost. I have the feeling that I have been in a big huge maze where I obviously got lost but in the end, oh happiness, I found my way out. I’ve had help from expected and unexpected places, for which I am very thankful. But now I am back. And I want to talk about yarn and knitting again. The gates of inspiration have been opened, and I need to share about my knitting, like I always do in this blog. 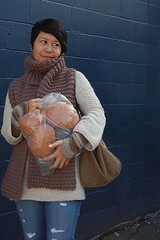 How misschievous I look with that big huge bag of yarn..! I would say, come and be misschievous with me because in the month of October, I am going to give out several knitting patterns for free. Ha, and now you want to know more about the scarf I am wearing? Come back in a couple of days and I will tell you how it is made and with what yarn. Good to be back… I’ve missed you guys… thanks so much for your sweet e-mails and comments inquiring how I am doing. Thank you for reading and see you in just a couple of days! You are currently browsing the Getting Purly With It blog archives for October, 2009.